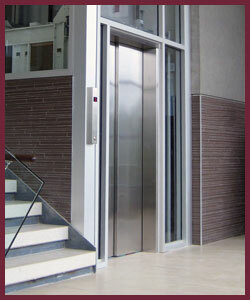 A LULA is a Limited Use/Limited Application hybrid between a commercial elevator and a wheelchair lift. While it looks and works like a traditional elevator, a LULA's only purpose is to provide accessibility for handicapped residents or visitors to a building. LULA elevators can travel vertically up to 25 feet at a speed of up to 30 feet per minute. A LULA elevator is limited to a capacity of 1,400 pounds and 18 square feet of floor space. A LULA elevator takes up about half the space of a traditional elevator and requires only 14 inches for a pit, 102 inches of overhead space for an existing building, or 134 inches for a new construction. The LULA's hoistway may be made of wood or sheetrock, unlike the concrete hoistway required for a traditional elevator. A LULA costs much less than a commercial elevator. It only needs to be maintained every six months, compared to every month as required for a traditional elevator. This makes it much more economical over the long term. While a LULA is similar to a wheelchair lift in some ways, there are several differences. A wheelchair lift can be installed on a staircase rail, or it can transport a wheelchair vertically. A wheelchair lift can be installed either indoors or outdoors. A wheelchair lift's motor may be located in a machine room or in a tower at the top of the stairs. The wheelchair lift folds up when not in use. A wheelchair lift that rides along a staircase can carry up to 450 pounds and can travel up to 23 feet at a speed of up to 14 feet per minute. A pit is not required for a wheelchair lift. A vertical wheelchair lift can carry up to 750 pounds and can travel at a speed of up to 25 feet per minute. The cab can travel up to 12 feet with two stops. A vertical wheelchair lift can be used indoors or outdoors. In some cases, an elevator shaft is required. A LULA elevator is a good option for providing accessibility for handicapped individuals inside a building. It can travel faster and transport more weight than a wheelchair lift and costs a fraction of the amount of a traditional elevator.